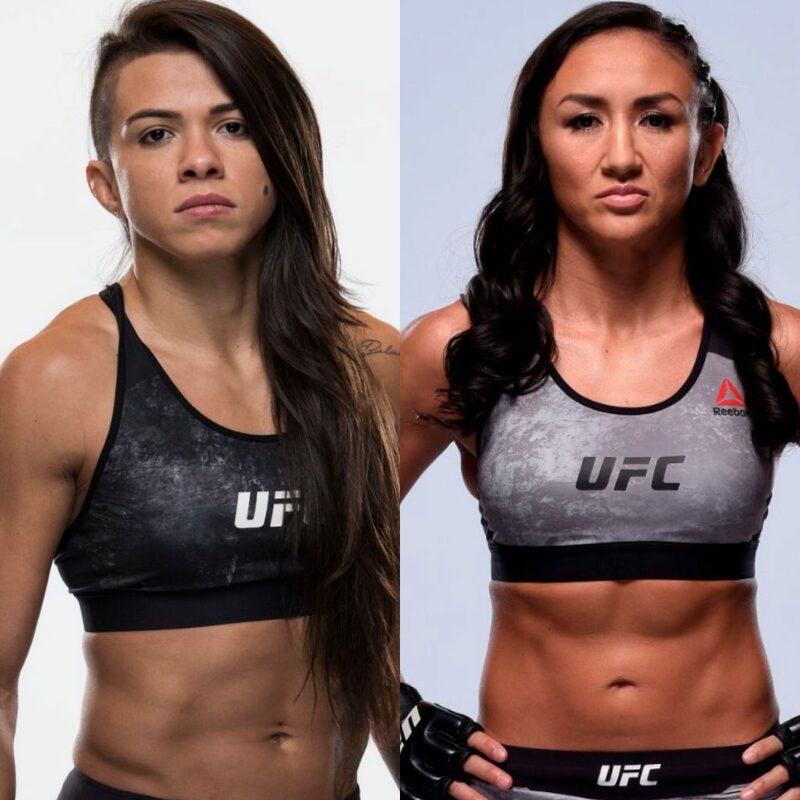 This Saturday night at UFC 225 we have an important matchup in the strawweight division, when former title challenger Claudia Gadelha and former champion Carla Esparza meet in the Octagon in a fight that could very well determine the next challenger to the queen of the division, Rose Namajunas. Gadelha is coming off a punishing loss to Jessica Andrade, one which cost her the spot as the #1 fighter in the division behind the champion. She hopes to get a win over the streaking Esparza, establishing herself as the fighter to beat at strawweight and hopefully putting her in position to challenge for the belt. 5) Use Footwork. Esparza is outgunned in regard to power, strength, explosiveness, and all-around athleticism, not to mention the fact that Esparza is the more effective striker, grappler, and wrestler in terms of results and amount of success against elite opposition. To navigate this, Esparza needs to use active footwork to create space and force Gadelha to chase her, or work to get into range to strike and to stay in that range. There are four reasons for doing this: First, it will force Gadelha to use energy trying to pursue Esparza, which will limit her opportunities to throw in combination or attempt takedowns, and it will force her to burn energy trying to trap her. The second reason for doing this is it creates opportunities to pick Gadelha off as she seeks to close the distance, filling the space she creates with her movement with strikes for Gadelha to run into if she overpursues or flurries. Third, if the previous two tactics are effective, this will also allow Esparza to set traps to hit reactive takedowns. 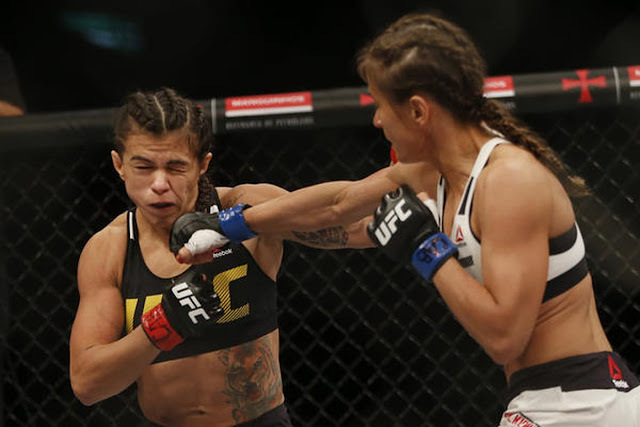 The final reason to do this is that this combination of energy burning forward pressure, walking into strikes, and takedown attempts will help handcuff Gadelha offensively in regards to how aggressively she attacks and which techniques she uses, and that ultimately will limit how consistently she can bring her athleticism to bear. This creates more of a level playing field between Esparza and Gadelha. 4) Return Fire. Carla Esparza isn’t a big hitter and isn't a volume striker, meaning she isn’t going to back Gadelha up as Andrade did, nor is she going to drown her in a torrential downfall of strikes. Nonetheless, Esparza can’t afford to let Gadelha gain momentum; if she begins to put her punches together, she will break her down, if not knock her out. Gadelha’s still improving boxing is among the best in the division, as shown against Karolina Kowalkiewicz, Cortney Casey, and Andrade. 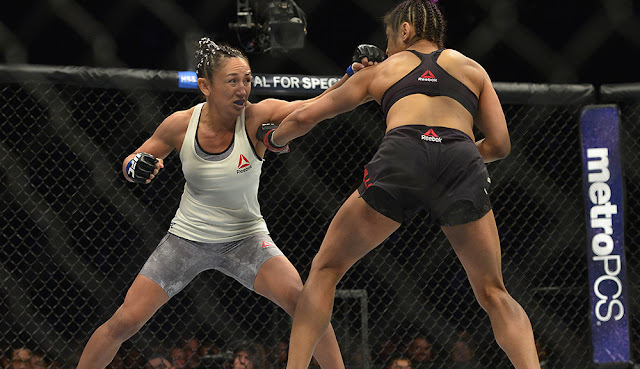 If her boxing doesn't put Esparza away, the impending level change and takedown into ground strikes or submissions will, as it did against the aforementioned fighters. To avoid that fate, Esparza needs to return fire against Gadelha, which will make her hesitant to use her jab or put combinations together; this will hinder her ability to apply forward pressure, which creates exits for Esparza to use to keep her from being pushed to the fence or getting stuck there. Much like Esparza did against Cynthia Calvillo and former amateur boxing standout Maryna Moroz, it was not necessarily outstriking them or outworking them, but not allowing them to find their rhythm that set up her offense, and as a side effect it allowed Esparza to limit the amount and quality of shots she absorbed, which led to her being able to get takedowns, or control opponents with takedown attempts as a result. In both cases, Esparza navigated superior athletes and strikers by using timely and efficient counters to manage her own inconsistent boxing, while also allowing her to get her takedowns on track by forcing her opponents to acknowledge the threat of her strikes. 3) Takedowns/Takedown Attempts/Grappling Exchanges. Most of Gadelha’s opponents are wary of both her takedown defense and her striking ability, which hinders their willingness to attempt takedowns. This makes them two-legged heavy bags for her combination of strikes and power punches, enabling her to move freely around the Octagon conserving energy by dictating the terms of the engagement. The most exhausting aspects of mixed martial arts would be the grappling exchanges, which so many fighters don’t initiate for fear of reprisal from Gadelha. Esparza can’t allow that to happen; she has to shoot early and often, using them to limit Gadelha’s opportunities to open up offensively on the feet, exhaust Gadelha by controlling her against the cage, forcing Gadelha to defend extended attempts to finish takedowns, and repeatedly make Gadelha have to work back to her feet. Most importantly, shooting for takedowns hinders Gadelha’s chances to make attempts of her own to do the same to Esparza with her wrestling and grappling. By engaging in extended grappling exchanges defensively and offensively, Esparza has been able to walk down and beat up a number of “name” fighters in the division, including Namajunas, Calvillo, Maryna Moroz, and Juliana Lima in the UFC, and Angela Hill, Jessica Penne, and Tecia Torres in the TUF house. Grinding out opponents with a grapple/wrestle attack has been a hallmark of Esparza’s game; she must stay true to that if she wants to get the most important win of her career. 2) Attack Multiple Levels. For as good and dynamic a striker Claudia Gadelha is, she is somewhat limited as a kicker, as she is much more functional than she is technical. Esparza needs to take advantage of this lack of development in her game by scoring early and often with kicks to the legs and the body. By consistently using the kicking game, Esparza can both score points -- taking some of the spring and explosiveness out of Gadelha -- and punctuate any flurries or combinations with kicks. This allows her to take away any advantage Gadelha has in height or reach in a fashion similar to what she did with Calvillo, and in much the same way Joanna Jedrzejczyk and Casey were able to have success against Gadelha. Secondly, being shorter than Gadelha makes it easier for Esparza to get underneath incoming strikes, land to the body (which can punch holes in Gadelha’s gas tank), and establish a rhythm on the feet, which creates openings for Esparza to follow her work to the body by coming over the top with punches. 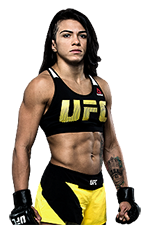 By attacking multiple levels, Esparza can neutralize any technical advantages Gadelha has by multiplying the amount of weapons and techniques she uses, as well as the targets she attacks, basically attacking superior technique and tools with veteran savvy and seasoning (i.e. strategy and fight IQ). 1) Avoid Extended Striking (Boxing) Exchanges. To beat an elite opponent, you cannot concede ranges. Doing so allows the opponent to dictate when, where, and how the fight goes as a result of you trying to completely avoid certain ranges. For one it’s impossible, and secondly, the energy you expend trying to completely avoid certain situations is immense, and the openings it creates in other areas as a result of an excessive focus on one range is potentially disastrous. The trick in competing at the world class level is to engage in every range, doing it well and often enough to make sure your opponent has no area where they can save energy, whether due to comfort or your unwillingness to engage. But you can’t allow yourself to get drawn into extended exchanges in certain areas, nor can you allow yourself to get trapped in those ranges for extended periods of time. Examples of this would be Nick and Nate Diaz in matchups against BJ Penn, Paul Daley, Donald Cerrone, and Conor McGregor. Claudia Gadelha is a far superior striker, especially in boxing ranges, and while Esparza has to be willing and able to punch back, she can’t get overzealous, as extended exchanges of this nature will highlight her technical and athletic shortcomings. Esparza needs to do enough to get her respect, and make Gadelha work harder and faster than she wants. More importantly, she needs to do this well enough to create openings for her to enact other aspects of her game, the same way she did against Calvillo, Lima, Penne, and Moroz. Make no mistake about it, Carla Esparza is facing the most athletically gifted and balanced fighter she has faced in her career. In the best case scenario this is an uphill battle, but I believe if she can enact these five things she can and will be able to combat Claudia Gadelha well enough to pull the upset and solidify herself as the next challenger for the belt. This Saturday night at UFC 225, either Esparza’s experience, mental toughness, and seasoning will take her to victory, or her lack of athleticism and depth of striking will lead to another one-sided loss to the elite talent in the division.